Collagen is the most abundant protein present in the human body because it is an essential constituent of the skin which is present in skin, the largest organ in the body. Collagen is responsible for the strength, elasticity as well as the provision of structure for the skin. Proper and effective utilization of collagen will result in a smooth, plump and wrinkle-free skin. Collagen masks are optimized to boost the amount of collagen content in the skin as well as slow down its degradation which occur over the years as we grow older leading the skin to become thinner, drier and weaker. Have you tried our Jasmine Collagen Mask? Jasmine oil is extracted from the Jasmine flower. It has a strong, sweet fragrance and contains a wide range of organic compounds. These compounds imbue the oil with benefits for health. It can help relieve depression, prevent infection, reduce a cough amongst other things. Jasmine oil also has properties that enable its use in skin care. It is used in the treatment of dry, brittle and dehydrated skin. Jasmine oil is also beneficial for the treatment of eczema and dermatitis. Besides, hyaluronic acid is yet another naturally occurring compound found in the body that is massively used in the cosmetics industry. This is because of its ability to hold and secure moisture in the body. Hyaluronic acid also helps the skin maintain a youthful look and the reason for its infusion of products used to care for the skin such as creams, serums, and supplements. Hyaluronic acid offers many benefits to the human body such as joint support (which is why it is used to combat osteoarthritis), cartilage resilience and compression resistance. Using this acid results in higher moisture retention by the body which means that the skin is more elastic, suppler, and youthful than it would otherwise be. 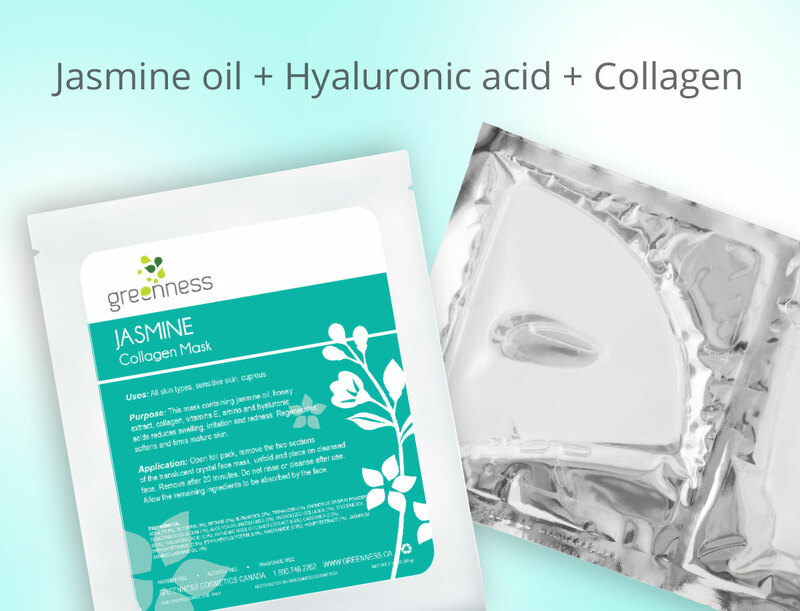 Jasmine collagen mask contains collagen, hyaluronic acid, and jasmine oil. It also contains honey extract, vitamin E and essential amino acids proven to be of benefit for the skin. This product is guaranteed to help you regenerate, soften and firm your mature skin. It is one of the best skin care products in existence and if there is anything that’s called skin care magic, a jasmine collagen mask will work it for you. It is recommended for aging people looking to maintain their youthful look, it is also recommended for the youth to keep their skin looking supple and fresh. Jasmine collagen mask is a product that should be utilized in your quest to find the perfect way of taking care of your skin, this is a product that every woman should possess and make use of in the quest to achieve flawless, gorgeous skin.